° Updated Brick Cottage in the heart of Midway Hollow. Quiet street and interior lot. Hardwoods in all living areas and bedrooms, ceramic in kitchen an bath. Character maintained and Kitchen and Bath have been remodeled. Kitchen appliances include the dishwasher, microwave, refrigerator and stove. Full size washer and dryer area. Energy efficient home windows and roof recently replaced. One car attached garage. ° Refreshed kitchen with SS appliances, granite countertops, built-in cabinets with designer hardware, Brazilian Cherry floors & Restoration Hardware chandelier in Breakfast nook. Pretty, oversized Living Area boasts tall ceilings, plantation shutters & fireplace. Custom closets from Closets-By-Design in both Bedrooms. Large Master Bath with skylight & soaking tub. Spacious yard & patio. Community amenities: clubhouse, pool & tennis courts. ° Nicely update home with amazing cook's kitchen - white cabinetry, 10-foot island, granite & stainless appliances including gas range, dishwasher & built-in microwave. The kitchen is open to the large living & dining combination. Lovely powder bath in master bedroom, plus contemporary full bath in hall. Enclosed patio has laundry connections. French doors in the living area leads to wood deck and huge yard. Attached one car garage with oversized garage door with opener. Unique front door leads to another entry area with second front door. Fresh paint throughout, updating lighting, dark stained hardwood floors & more! ° Fully remodeled 3 bedroom and 1 bathroom home featuring stainless steel appliances, beautiful laminate wood flooring throughout, white tiled bathroom and fenced in backyard. This home is ready for move in and ready to be enjoyed by the lucky new residents. Located off of Marsh lane with easy access to the Tollway and I-35, you are in a prime location! Tenant and Tenant's Agent to verify dimensions, square footage, schools and all information contained herein. ° Listing Agent: Donna Bosse, Donna Savariego Homes, Inc.
° This charming 3 bedroom, 2 bath home features custom wood paneling throughout, a spacious living and dining room, beautiful kitchen cabinets, tile floors throughout living areas and carpet in bedrooms. Convenient access to the North Dallas Tollway, 635 and 35! ° Beautiful 3 bedroom 1 bath home in the very desirable Berkshire area. New homes going up all over the neighborhood. Stainless steel appliances, granite, refinished hardwood floors, new bath, new double pane energy efficient windows, this house looks AMAZING!! Bring your decorating ideas for the back yard, the house is move in ready!! This home is priced aggressive so go see it TODAY!! ° Renovated in the last few years, this attractive home in Midway Hollows features a spacious kitchen open to the Living & Dining areas. The kitchen features granite countertops & appliances including an electric range, dishwasher & refrigerator - plus a laundry closet with a stacked washer & dryer included. The master bedroom is located on the west side of the house and has a private bath with a pedestal sink & shower. The two guest bedrooms are situated on the east side and share a nicely updated guest bath. Hardwood floors - no carpet. Large backyard with patio. ° Beautiful Remodeled Home in the sought after area of Northwest Dallas! This house has it all! Granite counter tops, newly refinished dark hardwood floors, remodeled bathroom and a large corner lot with colorful flowers, plush grass in backyard and amazing outdoor entertaining space. Home also boasts a brand new garage, fence, roof, and gutters. Everything has been taken care of! Just move in and enjoy! ° Excellent Condition, New Bathroom, New Kitchen, newly refinished hardwood floors through out except for kitchen which is new tile. Interior has been completely repainted. Large fenced lot with beautiful trees. Attached Garage Lovely house!!! AGENT is partial owner of the house. ° Nicely maintained home with lots of character in the established Sparkman Club Estates. Beautiful hardwood floors throughout, formal and informal living spaces, spacious backyard and big kitchen. Great area with lots of activities including and access to the Sparkman Club pool and clubhouse (as a resident there is a separate fee for those wanting to join). ° Additional Info: Pets allowed, unfurnished, onsite W/D connections, available now, 2 covered parking space(s), Dallas ISD. ° THIS IS A BEAUTIFUL HOUSE LOCATED IN MIDWAY HOLLOW. Very Nice and clean renovated home with stainless steel appliances, hardwood floors, gated driveway, garage. Light and Bright. Located on a secluded street in Midway Hollow. OWNER AGENT. ALL DIMENSIONS HAVE BEEN ESTIMATED. SHOULD BE VERIFIED. This house will be available June 1, 2019. ° Light, bright and open interior. Galley kitchen has newly replaced cook top, disposal,an eat in breakfast nook with built in hutch and view to patio and backyard. Large living room with a fireplace, engineered wood flooring throughout the home, dining room with French doors, and large bedrooms. Large exterior lot with patio in the backyard, large mature trees, landscaping, sprinkler system. Landlord provides yard care and pest control. Close to schools, Sparkman community pool, and shopping. ° Listing Agent: Jerry Tabor, Ebby Halliday Leasing & Prop. ° Ideal location, quiet community, located just south of 635. Beautifully updated, one-story, light and bright with vaulted ceilings and skylights. This home is one of the larger in the community with a big backyard - two patios - one off living room and the other off the Master. The Master has large en-suite bath with stand-up shower, separate tub and double sinks. Stainless steel appliances and quartz countertops. Both front and back yards maintained by HOA (paid by owner). Community pool and tennis courts. ° Cottage style Dallas home completely remodeled. MUST SEE. Owner is looking for qualified tenant for immediate occupancy. This Dallas home is situated in a quiet family friendly neighborhood. This 3 bedroom and 2 bath has been updated and remodeled. New flooring and appliances. OWNER WILL INSTALL NEW WASHER and DRYER combo! Landscaping and fencing have been updated. Close to schools, shopping, restaurants, and entertainment. Minutes from several major highways( north Dallas tollway, Stemmons Fwy, Central Expy). Minutes from downtown. Ready for move in for qualified applicant. ° Updated home in Sparkman Club. Fresh floors, paint, new appliances, fence, and much more. Back yard with Bob privacy fence opens directly to new biking and running trails. 5 minutes to LBJ and 10 minutes to Galleria, I-35, and shopping and dining attractions. Listing agent has equitable interest in property. ° Additional Info: No pets allowed, unfurnished, 2 covered parking space(s), 1 fireplace(s), Dallas ISD. ° Remodeled beauty with towering trees on large lot. Just replaced windows, appliances, granite countertops, plumbing, light fixtures, ceramic tile, paint in and out. Refinished original wood floors. Large walkin closet in master w beautiful refinished bath. Large 3rd bedroom w walkin in closet. Tenant may join Sparkman club with swim and tennis. ° Wonderful open floor plan in Sparkman. Updated kitchen has granite and breakfast bar that opens to family room with a fireplace. Large back yard has a sparkling pool and separate fenced off play space. Sunroom off den is great 3rd living area. Available April 22nd. Pets on a case by case basis. ° Additional Info: Pets allowed limit 1, unfurnished, W/D connections incl., available 4/22, 2 covered parking space(s), 1 fireplace(s), Dallas ISD. ° Listing Agent: Joanne Vetterick, Compass RE Texas, LLC. ° Thoughtfully updated and located in the highly desirable Midway Hollow neighborhood, this home is situated on an oversized lot canopied by mature trees. A large cedar-covered patio creates an outdoor living space overlooking the spacious backyard. Three bedrooms and three full baths, two generous living spaces and an open floorplan make this home a great place to live.Updates completed include new electrical,plumbing, roof and HVAC also updated.Interior features include hand scraped hardwood floors,stone floors,Alder wood millwork,stainless appliance, granite counters and a large kitchen with island. ° Listing Agent: Forrest Gregg, Compass RE Texas, LLC. ° Beautiful, well maintained home with hardwood floors and a spacious, fenced yard. ° Beautifully REMODELED 4 Bedroom Home with DIVING POOL in an established northwest Dallas neighborhood. Large almost quarter acre lot with private backyard retreat. Open Floor-plan with HARDWOOD Floors, GRANITE SLAB, STAINLESS Appliances, custom ITALIAN backsplash, Double FRENCH doors, NICKEL Fixtures, Large Patio & Lawn. New 8ft cedar board on board privacy fence. Three living areas. Separate Master Suite. Walk to Elem Sch & park. Blks from 35, 635, DART ext. ° Charming home in Sparkman Club Estates. Tile entry with formal living and dining area. Kitchen with stainless fridge, dishwasher, oven, electric cooktop opens to den with hardwoods, FP and french doors to wood deck and large backyard. Hardwood floors continue thru all bedrooms; Master with private bath. Hall bath with whirlpool tub & shower, tile floors & pedestal sink.Large laundry room; Large 4th bedroom has private entry and full bath. ° Additional Info: Pets allowed, unfurnished, onsite W/D connections, available 5/3, 0 covered parking space(s), 1 fireplace(s), Dallas ISD. ° Complete Remodeled mid-century style home in gorgeous, established neighborhood. Brand new HVAC, Roof, Windows and much more. Electric gate to secure drive & yard with new 8ft Fence. Come find out all the unique upgrades and imagine yourself as the new owner of this fabulous home. ° 4 bedrooms, 1.5 baths on .0651 acre lot. Large living and dining area. 4th bedroom well suited for den, playroom or office. Beautiful newly refinished hardwood floors. Updated kitchen with breakfast room. All appliances included. Washer Dryer hookups in the kitchen. Wood burning fireplace. ° Newly remodeled single-story mid-century ranch, with new paint, carpet, floors, modern fans and fixtures. Sun room overlooks the expansive 0.28 acre lot with a fountain pond, flagstone patio and lush landscaping which makes for a great backyard escape. Super spacious bedrooms, with walk-in closets. The master bedroom and bath are separated by an awesome sliding barn door, and two of the bedrooms are connected via a Jack and Jill bathroom. 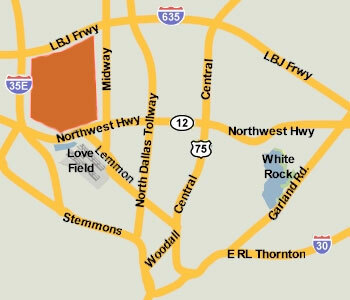 Situated at the end of a cul-de-sac in an extremely convenient location minutes from I-635 and close to the Galleria and all that the new MidTown Dallas complex will have to offer. 20 min to DFW, Love Field, Downtown Dallas and close to the best private schools in town. ° Additional Info: Pets allowed limit 1, unfurnished, available 5/1, 2 covered parking space(s), 1 fireplace(s), Dallas ISD. ° Updated, Move-in Ready Home in Popular Glen Meadow Estates. Spacious & Versatile w-4 Beds, 2.5 Baths, 2 Living, 2 Dining, Attached 2 Garage & Spacious Yard w-Side Yard (Great Dog Run). Home Views Back & Side of Large School Yard and Sits on a Quiet Corner Lot. Updates: WoodFlrs in Game, Dining & Hall; Beautiful Neutral Tile in Entry, Living & Kitchen; SSAppls incl Fridge; 3cmGranite in Kitchen & Baths w-Undermount Sinks; Travertine Tile Accents, Surround & Floors in Full Baths; Kitchen & Bath Faucets & Fixtures; Frameless Glass Shower Door in Master; Frieze Carpet in Beds; 8Ft BoB Fence; Radiant Barrier; So Much More! Dogs on Case by Case Basis, Sorry No Cats. $50 per Person over 18 App Fee. Avail April1, 2019. ° Additional Info: Pets allowed limit 2, unfurnished, available 4/15, 2 covered parking space(s), 1 fireplace(s), Dallas ISD. ° The latest modern by 3939 Urban Homes is READY! Sophisticated new construction in sought after Midway Hollow with phenomenal finish outs, tons of natural light & open concept living. Each space in this 4 bedroom, 3.1 bathroom home was thoughtfully created with a refined designer eye & offers indoor-outdoor entertainment opportunities. Chef quality kitchen with quartz counters, gas cooktop, built in refrigerator & large prep island. Master retreat with bonus room perfect for private office or exercise area. Master bath features separate vanities, soaking tub, custom closet & walk in shower. Private backyard with covered patio & open deck! Also available by the same builder: 3848 Valley Ridge & 3827 Van Ness! ° Another outstanding modern home by 3939 Urban Homes on an oversized corner lot. Located in sought after Midway Hollow the construction of this trend setting modern was completed in 2019 & features simplicity, beauty, serenity & an open concept design. Stunning gourmet kitchen w quartz c-tops & waterfall island, Miele appliances, built-in refrigerator, pot filler, gas cooktop, breakfast bar & ample cabinets. Master retreat w vaulted ceilings, beautiful oak flooring, built-in shelves, soaking tub, seamless shower & custom closet.Â 1st floor bedroom has private en suite. Enjoy your evenings outside on the deck or around the custom firepit.